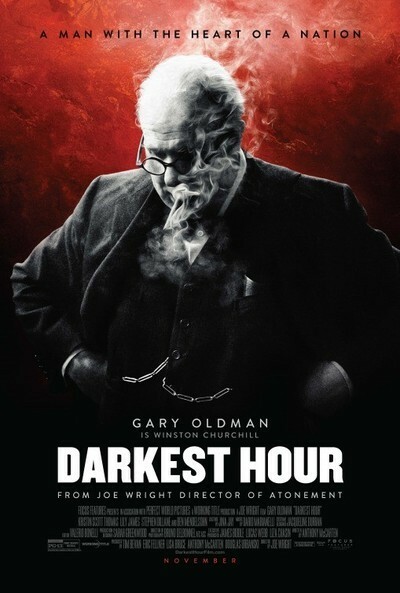 Gary Oldman seems a shoe in for the Oscar for his performance as Winston Churchill in the excellent DARKEST HOUR which recounts the early days of Churchill's time as Prime Minister. Grand old historical tale is a great deal of fun. This is exactly the sort of film that always seems to win Oscars. Many people hate them but many more love them hence they keep getting made. Personally I love them when they are as well done as this. While I love Oldman's performance I think the film works because the script is so damn good. Full of beautifully drawn characters, not just Churchill, the film is an absolute delight as we come to like everyone not just Churchill. The script is also so well done that we know everything we need to know to not only follow along with what happens but understand the implications. I love this film a great deal and while I wouldn't necessarily put it on a best of te year list I would put it on a list of my favorites.